For a couple of years now I have been wanting to try my hand at birth photography. I absolutely LOVE documenting events of all types (which likely stems from my background in journalism…), but I haven’t felt that I was in a good life stage to try… until now! My kids are a little older, I have a strong support system (we’re no longer "new” in Vancouver), and my confidence in my photography has grown greatly over the years! 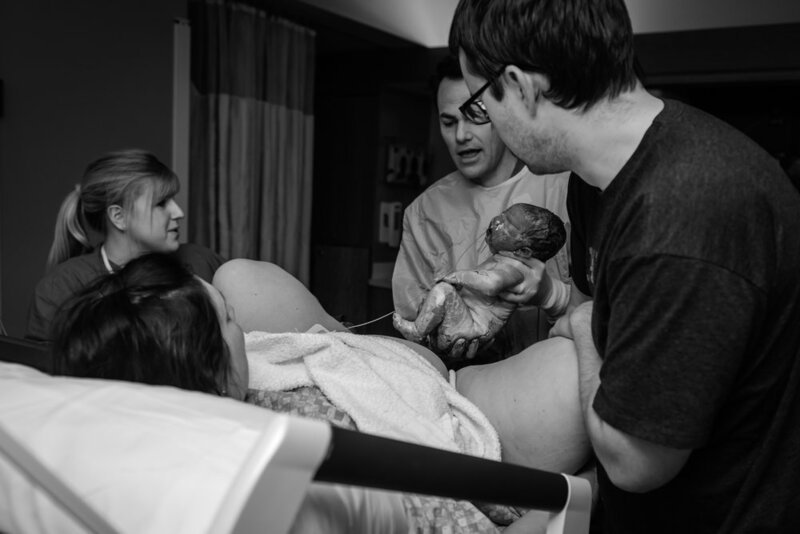 So, a few months back, I decided to put myself out there and give birth photography a shot! 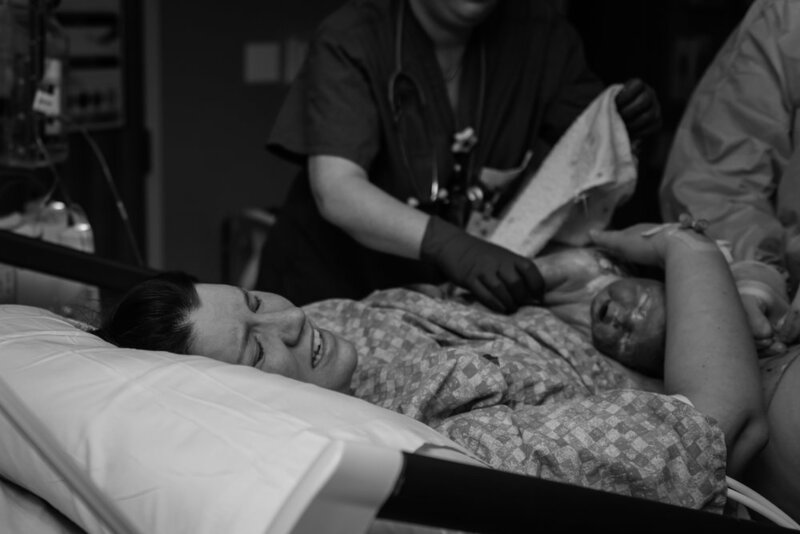 I found two amazing mamas in Vancouver, WA who were willing to allow me to document their birth experience and take LOTS of photos! They were both AMAZING experiences, and my first time being present for births other than my own two… so it was “new” for me all around. And I had the most amazing time. First, I’m going to start with baby Atlas; born at Legacy Salmon Creek Medical Center in Vancouver, WA. Due to medical concerns, Atlas’s delivery was a planned induction at 38 weeks, so I knew the date and had it on my calendar well in advance. Mom was admitted to the hospital at around 7:00 pm on Friday evening. Being new to this whole thing, and SUPER excited to finally have this opportunity to photograph a birth (!) I put my own two kiddos to bed, grabbed my stuff, and drove to labor and delivery at Legacy Salmon Creek to check in with Mom and Dad and see how things were progressing. Mom wasn’t dilated much, and things hadn’t changed in the two hours, or so, that I was there visiting with them, so I gave them strict orders to call if anything started happening, and went home to get some rest. The next morning we exchanged a few texts (no real progress), and I went about my morning routine at home. After my family was up, fed, dressed, and settled, I headed into the hospital… not knowing that it would be almost 24 hours until I saw them again! When I returned to the hospital, Mom and Dad were still patiently waiting for contractions to become regular, and for Mom’s cervix to start dilating. There were some phone calls to family, snacks from the cafeteria, Face-timing with their older daughter, and changes into comfy socks. Grandpa even came by to check in on his son and daughter-in-law and be present, for awhile, for his soon-to-be grandson. As the afternoon wore on, dilatation increased to about 5cm, and the bag of water was broken. The contractions were getting stronger. After laboring all day, as dinner time approached, mom decided it was time to call in the epidural. After the anesthesiologist finished up, the labor and delivery nurse brought in the peanut ball to try to help coax the cervix open even more. I had never seen a peanut ball before… I honestly don’t think it was available to me when my kids were born, but I have since discovered that that thing can be pure magic! As the sun set, labor continued. Mom was physically exhausted. Dad was emotional. And I had the honor of photography not only the birth experience, but the love and support between the parents. It was beautiful to witness. Before we knew it, the room was dark… Mom had surpassed 24 hours in the hospital. And, to most people, it was approaching “bed time”. I popped out quickly to stretch my legs and grab a snack. While I was gone, little Atlas’s heart beat started to weaken with the presence of each contraction. Mom was given a oxygen mask to wear… and had a panic attack. By the time that I got back to the room, things had settled a bit, but oxygen was needed. Mom had to gather all of her strength and bravery and overcome her own anxiety over having the mask on her face, in order to protect her, still, unborn child. Still only at around 5 cm, I could see the determination, mixed with incredible exhaustion, in her face. For hours we sat there, in the dark, trying to rest for the events ahead… occasionally getting visits from the nurses on duty to move Mom around and try to coax Atlas to drop. In the late evening hours, Mom finally made some progress and was up to 7 cm. But Atlas was still sitting high. The wait, and oxygen, and (very little) sleep, continued. Around 4:30 am on Sunday, Mom was in so much pain, that the nurse on duty suspected something was near, called the doctor, and started to get the delivery table set up. 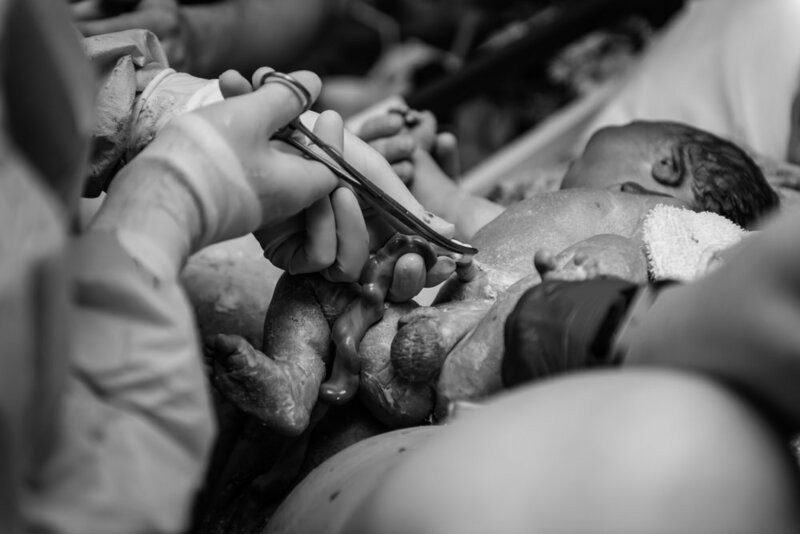 He arrived, checked her cervix, and declared that she was dilated to… 7 cm. The energy falling in the room was palpable. Mom’s OB, Dr. Jacob Calvert, suggested some more time on the peanut ball, and positioned it (and her) once again. She asked about a cesarean. She had now been in the hospital, being induced, for approximately 34 hours and was physically, and mentally, exhausted. Her doctor urged her to try to hold on just a little while longer, but told her that he was happy to discuss other options if she did not progress in the coming hours. It seemed to happen so fast… Mom started complaining about pressure and called the nurse in. The nurse’s eyes got WIDE and she ran out of the room. A few minutes later, Dr. Calvert was back, and Mom was at 10 cm and Atlas had dropped! It was time to go! Thank you peanut ball! With just four minutes of pushing, little Atlas was born at around 7:30 am on Sunday… two days after his induction started. And I was there to photograph his birth, and his parents pure joy and elation to finally meet him. I couldn’t have been more honored to be there to witness the whole birth experience. After having such an amazing experience, I have decided to start offering birth photography to pregnant mamas in Vancouver, Camas, and, possibly East Portland starting this fall. If you are interested in meeting me and discussion your delivery plans, please reach out! We can sit down for tea and get to know each other!